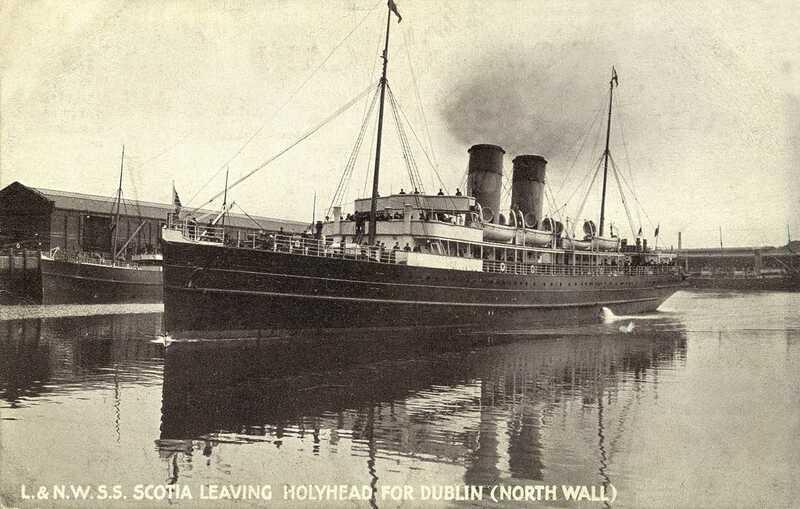 H.M. Transport Scotia, although in some writings it is erroneously (I believe) referred to as H.M.S. Scotia. 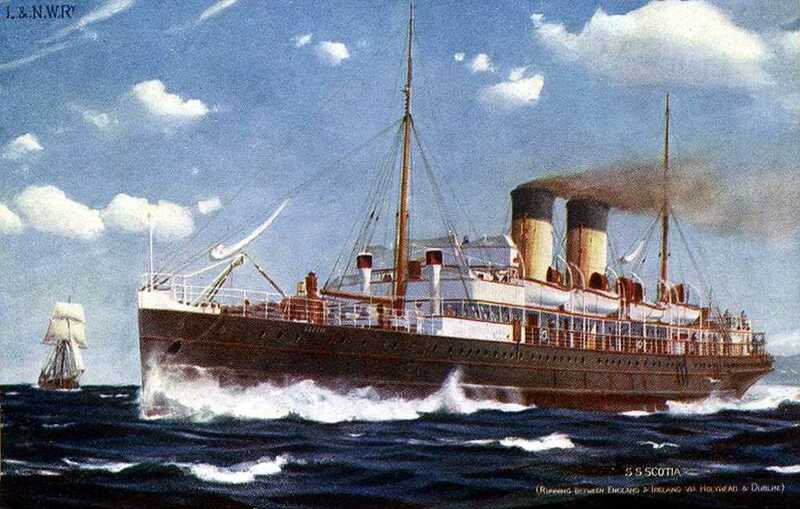 The S.S. Scotia was built by William Denny and Brothers Ltd in Dumbarton, launched in 1921 she was 3441 tons. She was owned by the London & North Western Railway (L. & N.W.R.) and operated as a ferry between Holyhead and Dublin with a crew predominantly from Anglesey. The Scotia was commandeered by the Admiralty during World War Two (WWII) as a transport ship (with the crew remaining the same, but with the addition of some men from the Royal Navy) and was known as either H.M.S. Scotia or H.M. Transport Scotia, depending on which source you rely for information. When, in 1940, the Germans sprang a surprise attack on allied troops in France, there was an urgent need to evacuate large numbers of troops to England, and so, the call for help went out, and vessels of all sizes and descriptions made their way to the French coast to help. The operation was called Operation Dynamo. Amongst the dangers for the hundreds of boats and ships that answered the call for help in rescuing over 300,000 troops from Dunkirk were German aircraft that had dropped mines on the inshore channels. Other dangers include the dreaded dive bomber, the Junkers 87, and the Heinkel 111, capable of dropping both bombs and torpedoes, and then there were the omnipresent U-boats. With the very experienced Captain William Henry Hughes at the helm (later awarded the Distinguished Service Cross (D.S.C.) for his actions at Dunkirk), and having already successfully carried two cargoes of troops from Dunkirk, the Scotia returned and embarked another load of troops, and began the journey to Dover. During that time she witnessed, at close quarters, the sinking of the H.M.S. Brighton Queen (Paddle Minesweeper), which must have struck fear into all of those on board the Scotia. Shortly afterwards, on the morning of the 1st of June 1940, H.M. Transport ship Scotia was attacked in waves of four Junkers 87 (Stuka) enemy aircraft, using both dive bombing and machine gun fire to try to destroy their target. Each of these Stukas had a rear gunner as well as a pilot so one or the other was constantly on the attack. Of at least four bombs that hit the Scotia, one went down the funnel before exploding, and soon the ship was listing astern. The order was soon given to abandon ship, but that was by no means the end of the ordeal for the crew and the thousands of troops onboard. More waves of enemy aircraft attacked again, killing many in the water by machine gun fire and dropping more bombs onto the ship. It was estimated that up to 330 onboard the Scotia had lost their lives, 28 of them being crew of the Scotia. Witnessing this, H.M.S. Esk – an E Class Destroyer - came to the rescue of H.M. Transport ship Scotia and helped to fight off the attacking aircraft, then coming alongside was able to rescue and take onboard over a thousand survivors. H.M.S. Worcester (a V & W Class Destroyer) also assisted in the rescue operation, and some men were taken onboard by them. H.M.S. Mosquito – a River Gunboat – also attempted to assist in the rescue, but she was dive bombed by a Stuka with further loss of life, although survivors on that ship kept the guns going until all ammunition was expended. It is apparent that there was a break in the air attacks from the Stukas that started at 12:30pm and lasted over two hours, which probably accounts for those rescued – including the wounded - actually getting out of Dunkirk and back to England alive. As is well documented, Dover played a key roll in the withdrawal of troops from France, less well known is that almost 50,000 troops were landed at nearby Margate. This then was the reason that one of the Holyhead crew (Richard Jones – Quartermaster of the Scotia) was buried in Margate Cemetery. One can only assume that Richard- aged 48 - had been wounded or injured and subsequently died, either on the journey to Margate or soon after arrival, whichever was the case his death is recorded as the 2nd of June 1940. Operation Dynamo had been an overwhelming success, but not without great cost. Over 320,000 troops were rescued, but 230 plus boats had been destroyed along with the ensuing loss of life. May God rest their souls; they were heroes to a man in my eyes. 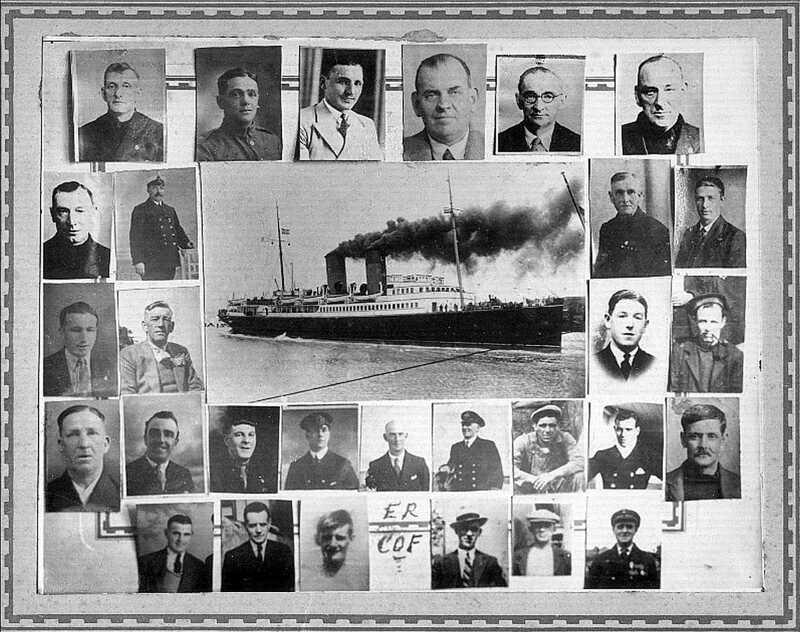 H.M. Transport Ship Scotia - Photos of the Holyhead and Anglesey men who died at the sinking in Dunkirk and in the following days. Alphabetical list of names from the Scotia, including the master who had died before the sinking: As you can see, several crew made it back alive to Britain, but died later of their wounds, to be buried at Maeshyfryd and Margate Cemeteries. I am told that some of the survivors had quite terrible wounds that they carried with them throughout the rest of their lives. Bateman Arnold Wilson 55 18/01/1940 Master Holyhead - St Seiriol Churchyard Husband of Annie Elizabeth Bateman. Son of John and Elizabeth Bateman of Holyhead. Devonald Owen Edwards 60 01/06/1940 Chief Engineer Officer Tower Hill Memorial Son of John Thomas and Catherine Devonald of Holyhead. Jones Richard 48 02/06/1940 Quartermaster Margate Cemetery, Kent Husband of Katie Jones of Holyhead. Jones William 56 01/06/1940 Fireman Tower Hill Memorial Son of William and Margaret Jones; Husband of Lilian Jones of Holyhead, Aylesbury? Williams Hugh 38 01/06/1940 Fireman Tower Hill Memorial Son of Hugh and Mary Williams; Husband of A.E. Williams of Holyhead. If you have any stories - of either casualties or survivors - including high resolution scans of photographs - I would love to receive copies for inclusion on this website. Please send them to me at this email address. Or if you want me to come and take copies of any photographs I would be delighted to do so, I wouldn't even take the photographs away, simply photograph them in your home.